Essence's Model Rocketry Reviews (EMRR) is happy to introduce a third "virtual" rocket contest. We are excited as this has been a never-before-done "virtual" rocket activity and we see no limits. So this time, with our wonderful sponsors, we are eggstra eggsited. So don't be chicken and enter our Egg-Payload "Virtual" Rocket Contest. So, grab your copy of RockSim (or the Demo version) and build a rocket that meets the requirements below and the "virtual flying" contest will take place on December 15, 2003. Entries must be received by 12/14/2003. Contest will take place from 12/15 - 12/19. Must be BT-70 with provisions to maintain the egg within a 2½" free space and accessible from 1 side. Each contestant will be assigned a different egg from a set of eggs in the EMRR refrigerator at the time of the contest. To give you some guidance, NAR contest rules says an egg would weigh between 57 and 63 grams. At least three diameters of body tubes must be used on the exterior of the rocket, the Egg-bay may count as one. Allowed Mass Objects are realistically sized/weight shock cord, eye-screws, etc. Eggxact Altitude: your rocket will fly with an egg, your choice of motor combination, and with your selected launch rod angle. The objective is to be closest to 1500 altitude and have an egg-safe landing within the field. RockSIM 7 variations will be active: Launch Conditions and Competition Settings. The placement score will be based on closest to the target altitude (feet). MEgga Altitude: your rocket will fly with an egg and a "contest impulse motor combination", a "contest mass-override", and "contest conditions". The objective is to have the highest altitude and have an egg-safe landing within the field. The placement score will be the Altitude (ft). Chickens Don't Fly: your rocket will fly with an egg and your choice of motor combination. The objective is to have the slowest flight and lowest altitude and have an egg-safe landing within the field. RockSIM 7 variations will be active: Launch Conditions and Competition Settings. The placement score will be based on lowest altitude (feet) and the slowest velocity (f/s). The Scramble Race: your rocket will compete in an all-rocket Scramble drag race with an egg and your choice of motor combination. All will fly at once in three races with your selected launch rod angle. The flight must have an egg-safe landing within the field. Placement will be based on 1) Fastest to clear launch rail (sec) with 48" rod; 2) Longest time to landing (sec), and 3) Lowest Range (closest to pad in feet). CD-ROM called "Simulating Strap-On Boosters to RockSim"
Any Style Flying Saucer of your choice of design up to a 29mm motor mount. EMRR Comments: There were too many points to count in these very unique (now let's see ya make them) lightning bolt fins! Impressive. Bob won the Chickens Don't Fly event (#3) with an interesting technique. EMRR Comments: Working the flexibility of a 5 motor cluster. EMRR Comments: Large tail feathers, to be shaken! And this 2-stager did shake them. It proved to be take the MEgga Altitude event (#2) by flying 34 feet higher than Bob Cox's. EMRR Comments: Was able to work something into the rules that was unexpected... an extended motor tube becomes an external tube! This is a sleek looking rocket. EMRR Comments: We get the "point" Claude. (That's the first thing that popped into my head when I first looked at this rocket). Unique fins give it a unique look. Nice. EMRR Comments: Jim's sleek-line designed paid off as he was the closest to 1500 feet in the Eggxact Altitude event (#1). Only missed it by 1 foot! EMRR Comments: Always coming to the contest with something unique, Bruce has done it again. He is actually a master RockSIM designer. EMRR Comments: Wow! 2-Stager, multiple motors. This entry shows the variety we were hoping for from this contest! EMRR Comments: How can you not say that this rocket is the most creative and theme based of the bunch!! Love it! Morgan, go build it! EMRR Comments: Bill did the most thorough job in designing and documenting his experience. Read it here. Thanks for the nice comments and sharing the experience. EMRR Comments: This would make a cool looking 2-stage rocket. I like the extension of the motor tubes and also the rear fin. EMRR Comments: Another slick interpretation of getting 3 external tubes. Don't know if it would get pass a "real" RSO, but it certainly works for a "virtual" RSO. EMRR Comments: With tail feathers, this rocket has a unique look. The 3rd body tube is interestingly placed on this. EMRR Comments: I always sit in anticipation of the first entry. This is because I build a test model or two to finalize the rules and events, but never know if it too specific. Steve's first entry helps resolve that. EMRR Comments: Designed to look like a pocket-knife, it has a unique profile. This was the heaviest entry and so it had some difficulties. But an entry is an opportunity! 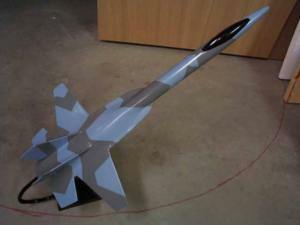 EMRR Comments: With those forward fins, this rocket looks "mean". Adding black, gives it an "evil" look. Ready to attack all those other chickens! EMRR Comments: What made this contest interesting, is the variability in techniques. Some use zero angle and varies motors to reach the altitude. The ones with a single motor, no doubt, varied the weight of the rocket. Others used rod angle to have the peak arc at 1500. As you can see, the leaders were very close with the difference probably attributed to egg weight and wind variation. EMRR Comments:I made the equivalents for Apogee F10 motors for each rocket. 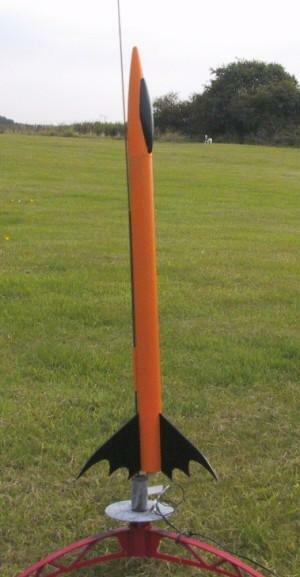 I also, set each rocket to 6 oz (for 2-stages, they were set based on the proportional weight of the original). I set wind and thermals to zero, rod angle to zero and let them rip! I really expected the 2-stagers to rule here and for the most part they did. But look at this single motor configuration of Bob Cox! It was only beat by 34 feet by a 2-stager! And those two rockets were over 1200 feet higher than the nearest competitors! EMRR Comments:Now this event is what balanced out those two stagers and cluster rockets. Surprisingly, though, Bill Krosney's 4 motor Eggscalibur was able to compete with the single motor rockets and came in second. It was hard to beat Bob Cox's though. I've seen some perform like this at real launches. We usually laugh. EMRR Comments:The Scramble Race has started. This is the first round, with the wind fixed at 4mph. The Sub-Total here will be added to the next two rounds to come up with a total points for the three rounds. Those will then be ranked to come up with the event points to be added to the other three events. EMRR Comments:This is the second round, with the wind fixed at 8mph. Here is where you really start to see rockets getting lost and damage to eggs (>13 f/s vertical). The rockets that are not getting DQ'd are the ones that are heavily angled "into" the wind, and/or reduced their motor sizes to avoid the higher altitudes. EMRR Comments:This is the third round, with the wind fixed at 12mph. Really threw most rockets right out of the field. Two of the rockets that did not DQ used low power motors so that they didn't go too high. The third, must have caught a good thermal. EMRR Comments:Well, so ends a third contest. By far the most difficult contest as well! I loved the designs. I loved some of the new challenges this contest created. And I'd love to hear back from all as to your feelings.... what worked, what didn't, etc. For the competition conditions the Model loss: at 25% seems rather high. . . Launch site diameter:- This is the diameter of the launch site. Any rockets landing within this circle are not considered lost.<BR>Max. model drift range: - This specifies the maximum drift range beyond the outside of the Launch site diameter. Any rockets that drift beyond this range are considered lost. Model loss- This is the percent chance of a model falling outside the Launch site diameter being lost. So the field size is 4000 feet, with an extra 1000 feet drift range. In that 1000 feet drift range there is a 25% change of losing the rocket. Outside of that 1000 foot drift range, in others words outside of 5000 feet, the rocket is considered lost. So going for very, very high is one thing, but ensuring your rocket comes back is more important. NOTE: If you have 7.00 - 7.01 this feature has a bug in it. So don't get frustrated with the results. Apogee will have this corrected soon (before the competition flying). You should work hard to keep it within the range of the field. You also have an ignition delay specified but do not include igniter variability for Drag Races, why did you do that? It is a default, but unless the igniter box is checked the delay time is not activated. Aren't the RockSim 5 and 6 users going to be upset about not being able to use the RockSim 7 variations? For MEgga Altitude, the unknowns are difficult for the design. Can we get clarification? If you concentrate on Contests 1, 3 and 4, EMRR will ensure success on Contest 2. We may even need to create motors to give everyone the same motor impulse and we won't have any DQ's. The objective of this contest has been to neutralize specifics of the design as much as possible to test the design out. I've downloaded the virtual3.eng file. How do I get RockSim to ONLY use those motors and ignore the other motors or other .eng files? NO CP or Mass overrides. But... are the CP and mass overrides present for database objects OK? i.e. I select an Estes NC, or eye-hook that has entered a CP and mass override, is that OK?